Answer: The pie chart shows the interest of students of a secondary school in different subjects. These subjects are Mathematics, Science, English, and Bengali. The percentage of students like these subjects respectively are 35%, 27%, 17%, and 21%. Thus the graph at a glance shows that the highest number of students have interest in Mathematics, and this is 35%. The lowest number of students like English and their percentage is 17. 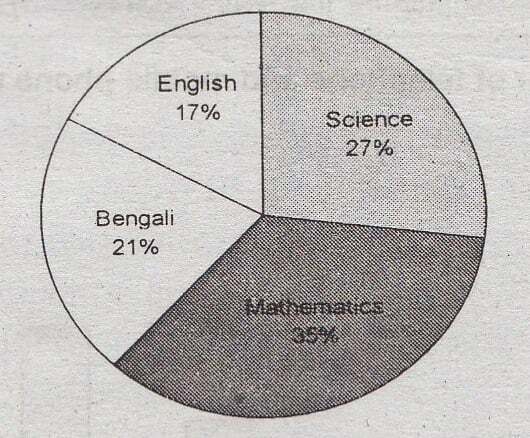 Science is liked by 27% students, and Bengali is liked by 21% students. In order of interest from higher to lower the subjects are Mathematics, Science, Bengali, and English. It is clear from the chart that the student of this secondary school has more interest in Science subjects and less interest in language subjects. The least interest is found in English.